Whether it’s wired or wireless, most people are using routers within their home networks. Every router will eventually need a firmware update in its lifetime. Whether it’s wired or wireless, most people are using routers with their in-home networks. Every router will eventually need a firmware update in its lifetime. Firmware is the software installed to the device. The manufacturer will periodically deploy updates to fix any issues within the previous firmware. If your router has been acting strange, it can most likely be fixed by an update. Some routers will automatically check for updates but many don’t (especially older models). It’s important to check once in a while for new update releases for your router. Here’s an example of how to update your router. I’ll be using a Linksys WRT54GS with version 6 hardware. Before getting started, you will need to find your router’s model and version. This information can be found on the bottom of your router. Now that I have confirmed the model and version, I can head over to the manufacturer’s website. Depending on what router you have, (Linksys, Netgear, etc.) you will need to visit the manufacturer’s site to find the firmware. 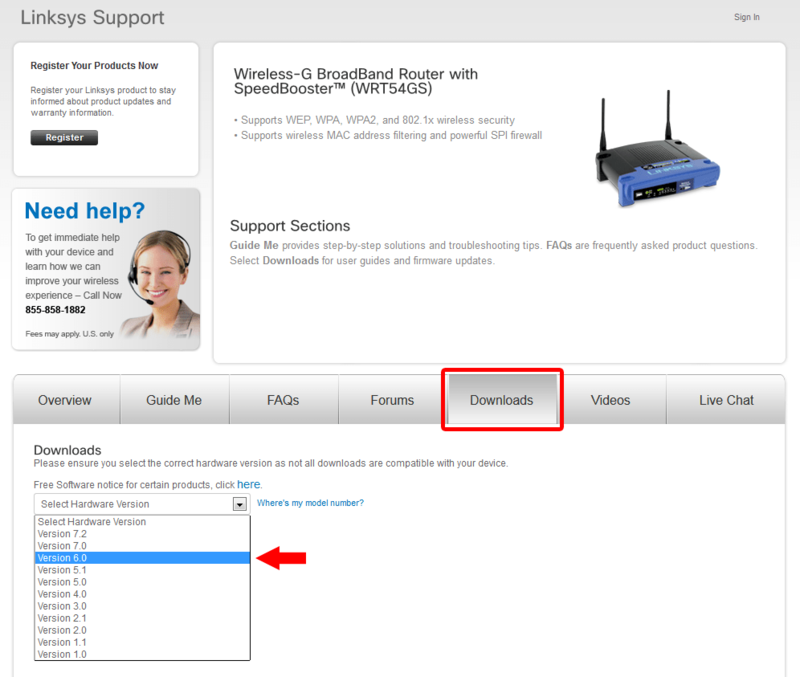 Since I am using a Linksys router, I’ll go to the Linksys website. Next, I’ll find their support page. Always look for the support page. This is where you will find downloads for devices. Now I can enter in the model number of my router. Next, I can click on the downloads tab at the bottom of the page and select the version of my router. Once the correct version is selected, click download next to the latest available firmware update. Agree to the terms if prompted, and save the file to your computer. Note: Save it to a spot you will remember. Now that the file is on your computer, you must log in to your network router. Did you forget how? You can open your web browser and type in the address of the router. Usually it will be 192.168.1.1 (I’m using 192.168.1.100) – and hopefully you can remember the username and password. If you did forget the log-in settings, you can hold the router’s reset button for 30 seconds to do a full system reset. The username and password will be set to the manufacturer’s default username and password. Here’s an awesome directory of all default log-ins. 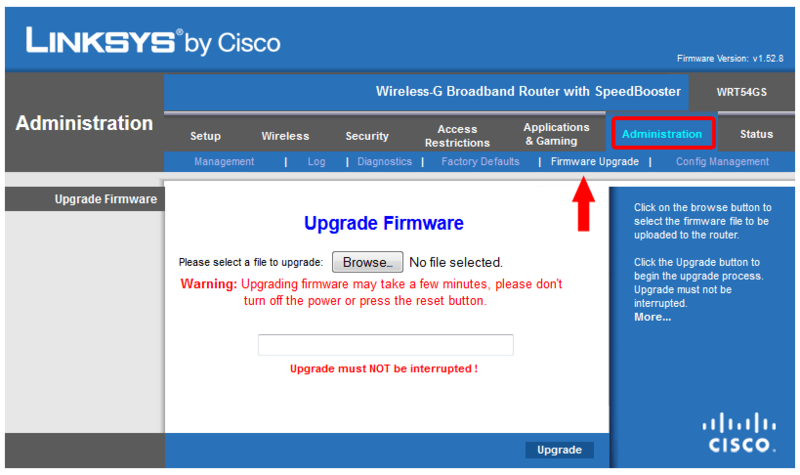 If you have successfully logged in to the router, you will need to find the section for updating firmware. This is usually found somewhere in the Administration section. Next, hit browse and select the firmware file you just downloaded. Read the warning before you begin. If at all interrupted during the update process, the router will become useless.. a brick.. a paperweight. Just be patient during the update process – it takes a few minutes. It is recommended that you do not update a router over WIFI. It’s best not to update a router during a storm where the power could potentially go out during the update process. Some firmware files require you to update the router ONLY through Internet Explorer. This was a problem I ran into awhile back. So, if you are having an error using Firefox or Chrome try IE.